This is a Sumatran coffee, thus Indonesian, and the most common Indonesian origin. 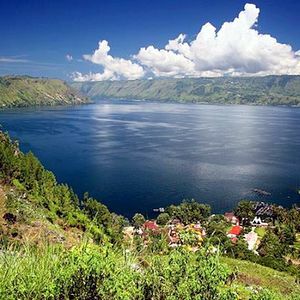 Lintong is a city, Toba a lake and Batak the ethnicity of the farmers in this region. 17+ refers to bean size. 17 is fairly large. In and of itself size isn’t that much of a determinant of flavor, but larger sizes mean that the coffee has been more carefully picked over during processing, and at least with Indonesians a certain portion of defects associated with small bean size are minimized. This is a wet process Sumatran, which excludes some of the earthy natural flavors often associated with Indonesian coffees, actually a byproduct of the more problematic dry processing methods traditional in this origin. It’s still quite distinct from the floral and fruitily aromatic coffees of Africa. This coffee’s traditionally Indonesian with darker aromatics which become quite chocolatey as the cup cools. I tend to roast this coffee a bit toward the dark end of the range. It would make a good Vienna roast, as the dominant flavor elements are capable of surviving a darker roast, and the roast flavors, more noticeable as the roast darkens, go well with the underlying flavors of this sort of coffee. Darker roasting also mutes the acidity of coffee, which, since this is a coffee without as much of the lighter notes that are acidity related, lets you have a milder coffee without losing the important specific qualities of the bean. Freshness is probably the single most significant quality distinguishing a really extraordinary coffee drinking experience from what you get drinking merely good, but old, coffee. There’s a very narrow window when roasted coffee is at its peak. Think of the difference between fresh baked bread, and day old, except the fresh period for coffee is a bit longer than for bread. This fresh period varies somewhat with the coffee, mostly relative to the degree of roast, but basically starts directly after roasting, reaches a peak a few days later, and then, roughly seven to ten days after roasting subsides into essentially stale coffee, not bad, or rancid, but missing the aromatic high notes, which are what distinguish one good coffee from another, and fresh from old.